Borrow a Bill from a spectator and ask him sign it. Show two empty cylinders, a silk and two glasses. The cylinders are placed side by side on a table. One glass is placed, empty, inside one of the cylinder. The second glass is placed into the second cylinder along with the signed bill, a silk and a rubber band. The magician now makes the silk and bill jump and change places over to the other cylinder and then back again. But, that is not the real miracle. Suddenly the magician lifts the cylinder and the glass is empty, the bill, the silk and rubber band is gone! It has mysteriously traveled to the other cylinder where it sits inside the glass with the silk tightly covering the opening of the glass held in place by the rubber band. It seems impossible! But, inside the glass is the borrowed bill and yes it has the spectator’s signature! 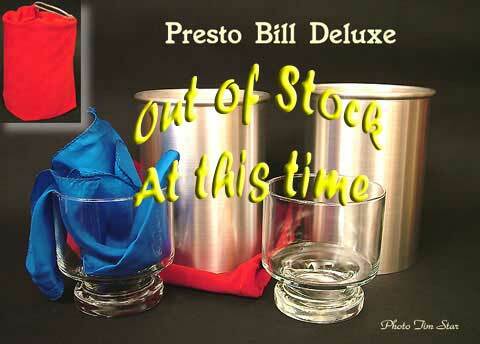 The Presto Bill Deluxe is perfect for stage, parlor or even close-up magic. This one will even stump the magicians! The Presto Bill Deluxe is one of the best and most mind-boggling tricks you have seen in years. It will make a very strong impact on the audience and it is very likely to be the highlight of your show. It is very easy to do. The cylinders are hand spun in aluminum with a satin finish. They fit perfectly inside each other for easy packing and traveling. You receive everything you need to perform the routine, as shown in the picture, including a handy carrying bag. The item is out of stock at this time.